When a “one to many” join linked by another “one to many” join in a serious of tables called as Fan Trap. Like the below example, Customer is having multiple Loan account and each Loan having Multiple Collateral which is “one to Many” & “One to Many” join in a series of tables. Result set in the back end execution. 3. The best way to solve a fan trap using dimension objects in the query is to use an alias and contexts. Create an alias for the fact table which is common for both dimension and another fact table. Create a join between the alias table and the original table and create a Measure object from CUST Loan Account instead of Loan Account. Create contexts as mentioned below. 4. 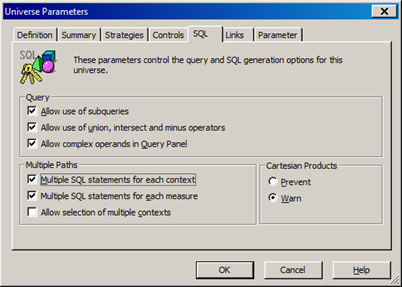 Once you created the context for each fact tables along with alias table as mentioned above and enable the “Multiple SQL Statements for each Context” in universe designer parameter, SQL tab. This is common solution for Chasm Trap. Now you can create the report and it will create separate SQL for each context and data will get synchronized based on common dimension Customer. Please read the post and write me back your comments. Hi Madhes, thanks for the nice article. 1 question is… where do the 2 empty Coll_Amt cells come from? Can you tell me where the Cartesian product come from… thank you. Thanks Dawei for catching up this issue. There was an data set mismatch in the example I have given. I have updated with correct data set (earlier the data set was not matching with Fan trap scenario, means the second fact table is not having one to Many relationship with first fact table.. that is where the confusion started). Yeah this time it doesn’t confuse me. 🙂 Thanks for the nice article. Based on the data, the 2 rows “1904 GOLD”,”1905 EDU CERTIFICATE” will not generate the wrong data, am I correct? 😊 yes! You are correct. Thanks for the informative post. 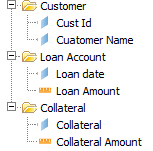 Quick question…What happens when you add “Collateral_CD” to the final block that has – Cust name, Coll Amt, Loan Amt? Does the Loan Amt get inflated? Collateral_CD object wont impact anything in report amount.